This funky looking store is founded by Johnny Earle, 28-year-old multi-million dollar business owner. 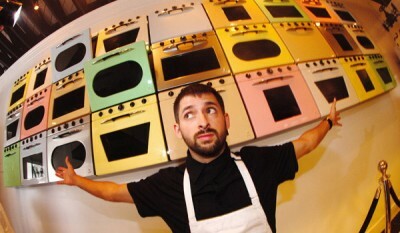 Known by his brand name Johnny Cupcakes the owners is famous for making a life changing decision to drop out of college and do what he loves most – design clothing. His clothing label uses an unrelated theme to fashion such as cupcakes baking to promote the brand. So the cupcakes is not the main product here, clothing is! The store design is modeled from vintage bakeries. 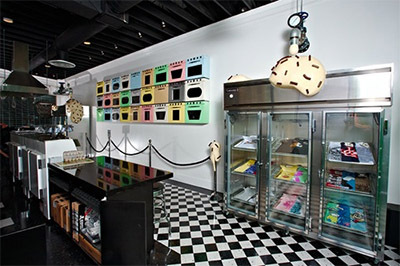 Johnny Cupcakes stores are filled with retro style ovens and pastry cases to display the brand’s shirts and hats. This unique concept of creating something this unexpected to sell clothes is successful. But a few customers have became upset after entering the store only to discover that clothing, not cupcakes, are sold there. 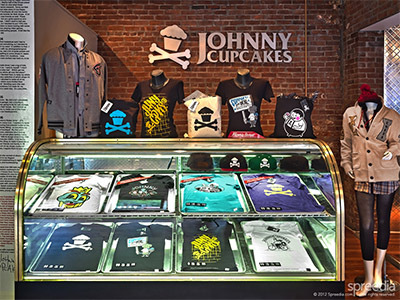 Johnny Cupcakes’s brand plays with our expectations that has made the company different and interesting. What do you think about this idea of creating an environment unrelated to the actual product?